Fiat hired the famous Brazilian band O Rappa to write and record a song about cheering for Brazil on the streets. A campaign they did for the FIFA Confederations Cup happening right now, hosted by Brazil. Fiat is a sponsor for this cup, and therefore they invested big in this campaign. The short video doesn't stop playing on intervals on the TV. The song is in everyone's mind because it's very captivating. The lyrics sing about rooting for Brazil, to cheer on the streets. That you don't need to go to a stadium, "Come to the streets, because the streets are the biggest bleachers of Brazil". And damn, that's a very good song. 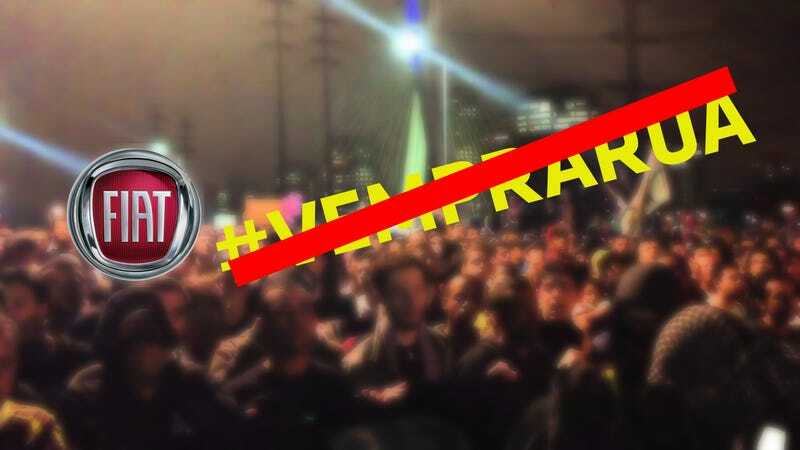 So, fiat's current slogan and try to promote themselves among social media is "Vem pra Rua", wich means "come to the street". The thing is, while we walk in da cup, all soccer fan eyes on us. All eyes on us, because there are also a LOT of protests happening in Brazil. And guess what phrase went viral, and what's a trending topic because it's very relevant to what's happening? "Come to the streets". Epic. And now, Fiat's pulling the plug on this campaign. Wait what? You mean there are millions of kids of the so desired Y-Gen on the streets shouting Fiat's campaign slogan and they're pulling the plug? They have the biggest opportunity of this decade of bonding with this "car-hating, bike-riding" generation and they're defenestrating it? Apparently (or according to some news), the government itself is making them pull the plug on the massive advertisement of the "Come to the Streets" campaign to stop inciting protests. Bummer. UPDATE: They are NOT pulling the plug after all. At least not early. Sources say they'll stick to the schedule and the broadcast of the song will stop next week as planned. But it still seems a bit early, considering it's not a small campaing.